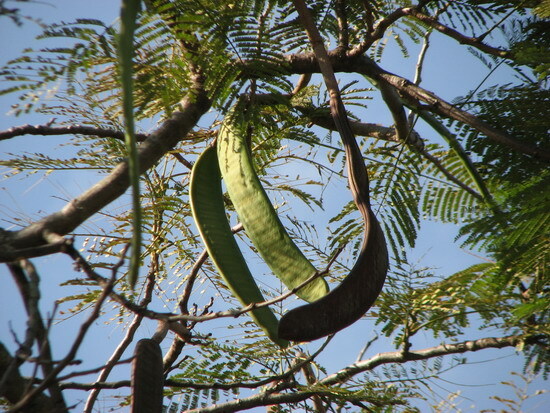 One of the English names for Albizia lebbeck is “woman's tongue tree”, that means a yenta. 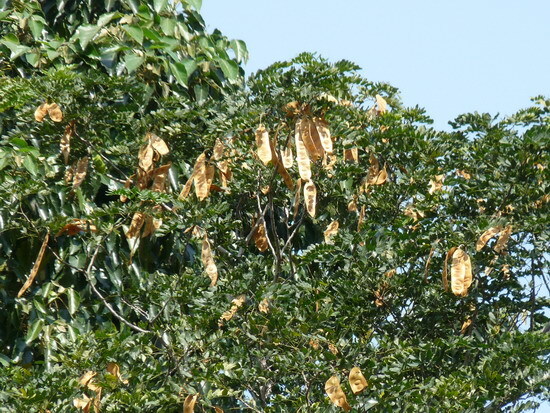 In winter, its pods hang on the tree and swing in wind. The seeds rattle inside the pods. If wind does not stop, the noise will never go. The name of “woman’s tongue” is well deserved. If you sit under Lebbeck with a girl friend in winter, listening to her chatter on and on, you may want to keep quiet and pay attention to the woman’s tongue under the “woman’s tongue tree”. However, be careful not to let your friend know what is in your mind when you giggle. I used to have a friend who loved talking but not willing to listen. I could not find any pleasure of conversation which should exist between friends. Gradually, I kept my distance. The other one which is also playfully known as “woman’s tongue” is Flame of Forest (Delonix regia). Its long bending pods do have the shape of a tongue.